The Markoprint IJet Thermal Ink Jet Printer is a fully self-contained programmable coder that employs the HP print cartridge. It has full programming data connectivity capability via its built in interface connections. It can be fully controlled right on its own control panel and screen. It is perfect for integration into automated track and trace systems. Wide variety of inks available for printing on porous and non-porous surfaces including food grade inks. 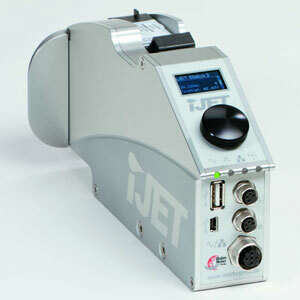 The IJet is a masterfully engineered compact coding system, with huge print capability, that can be installed on existing or newly installed systems. Its compact size allows to fit into the smallest of installation locations.